Strange, compelling creatures they are, recurring, fascinating down the ages. Lingering intrigued beside the sphinxes in the garden of Vienna's Belvedere Palace, I noticed I was not the only one. Many people stared boldly at their all-too-human smirking faces and pert breasts, then looked away discomfited from their animal haunches. I found myself thinking of the item dominating the news when I'd left London a few days before, the new legislation to permit the fusion, for research, of human and animal embryos. Despite myself, I felt a flash of sympathy for the Catholic and Muslim clerics loudly protesting this. Despite myself, for surely I welcome the real hope in embryo and stem-cell research of understanding, tackling some common and devastating diseases? I feel divided, I suppose. How much is it good to mess with things? And yet if there was really hope for dear ones to live or see or walk when we thought they would not, would I say no? There truly is hope, it seems. A boy is interviewed on the radio this week. An injection of genetic material into the back of his eyes appears to have halted loss of sight from retinitis pigmentosa. My heart lurches, as it always does when I hear of a young person losing their sight to this not uncommon genetic condition. Someone close to me when I was young was going through this, with devastating consequences to his life and lives around him. Will that contemporary of mine live to know his story has become a sad story from history - like that of common early death from TB? How strange, how miraculous, but also, for him and for others, how difficult that would be. It's warm, straight from shivery cold to very warm. Coats are off and a man on the bus is wearing a yellow sweatshirt. Extremely yellow. Yellow like the bus handrail, like a yellow highlighter pen layered on so thickly that the text beneath disappears. Fine on a canary, not on a person. All the way here it bothers me. Off the bus and walking away, ahead of me, through the crowds, bursts of glaring yellow are still visible into the distance. Tired, busy, crowded, yellow. Much too yellow. "The ancient biblical image suggests that we live in our differences, emblematically linguistic, on top of one another - like Franck Lloyd Wright's dream of a mile-high apartment building. But common sense tells us our linguistic dispersion cannot be a tower. The geography of our dispersal into many languages is much more horizontal then vertical (or so it seems), with rivers and mountains and valleys, and oceans that lap around the land mass. To translate is to ferry, to bring across. But maybe there is some truth in the image. A tower has many levels, and the many tenants of this tower are stacked one on top of another. 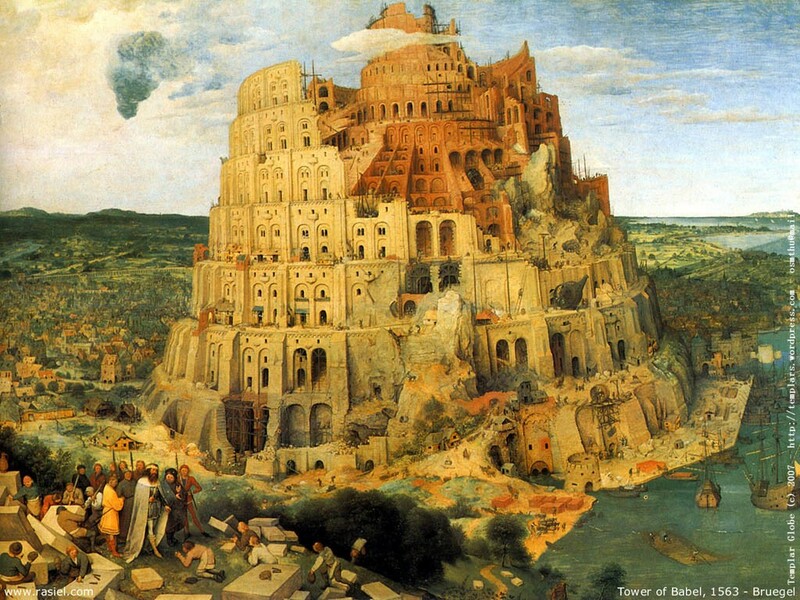 If Babel is anything like other towers, the higher floors are the more coveted. Maybe certain languages occupy whole sections of the upper floors, the great rooms and commanding terraces. And other languages and their literary products are confined to lower floors, low ceilings, blocked views." Susan Sontag brings new and striking resonances to the ancient image - particularly vivid for me as I'd recently seen Bruegel's astonishing painting in Vienna - in her essay, The World as India, delivered as the 2002 UK St Jerome Lecture on Literary Translation and published in the recent collection of her last speeches and essays, At The Same Time. The book is a breathtaking, poignant tour of an intellect at its peak. New design. I loved the elegant simplicity of the previous one, but it fatally lacked a sidebar - so no links, no blogroll. This here happened on the spur of the moment when I desperately needed to be engaged in doing other things, but you know how the brain gets hold of a frantic obsession sometimes and kind of goes off on its own... It suddenly seemed imperative to redesign my blog. I'll probably change it again, and obviously I haven't yet compiled the sidebar links. I need to get into the code and make the photos bigger - almost certainly beyond me. Anyway, comments welcome. The other thing going slowly in these parts is Spring. After soft, warm days in Vienna, back to persistent cold and damp in London. Just the one snowstorm, a week or so ago - a white cover gone in one day, but chill winds, frost and hail, along with heavy rainstorms. Jacques Réda, whose writing I'm just discovering with great enjoyment, calls these unfriendly between-seasons the 'badly tamed' months, when something gets into steel and concrete towers and stone statues and they bend and prowl under a wild sky like trees and beasts in the forest. There are more flowers and leaves every day, nonetheless, and louder birdsong, all of us shivering and waiting out the weather, turning our faces up to the brief bursts of sunshine. I learn from Dave that today is Poem in your Pocket Day. So here, quickly, is the one that lurks in the bottom of mine: the first poem, I think, that made an impression on me, aged 16 or 17. I could not recite it now, but every line of the Spanish has a familiar taste - something resonated in my gut, many years before I had the emotional or intellectual capacity to appreciate poetry. It's taken me ten days to sort my photos from Vienna into an album - here. I don't deal well with a lot of anything: multiplicity floors me. Five or six hundred photos, more than I can view on-screen at one time - how do I sort those? I couldn't, it turned out, not in one go. I could only sort and ponder them bit by bit, draw out themes and slowly filter them down. And slowly does get there. In fact, it has huge advantages. I've not only sorted out my photos, but got my head around Vienna, put it in place and begun to walk away. A favourite meditation teacher, Martine Batchelor, is much wont to say: "The more you have to do, the more slowly you need to do it." This may seem counter-intuitive, but it's not, if you think about it. Faced with tasks of potentially overwhelming magnitude, what you most need may well be calm and endurance. This has also been my approach, therefore, to the many hundreds of emails, files and queries awaiting me on return from holiday, and it has worked quite well. I'm getting through it. It's hard, though. To slow down a mind that panics and zones out in the face of multiple demands is a challenge for a lifetime. A disastrous hare, perhaps I may aspire to be a viable, effective tortoise. Um, can you tell that's me reflected in the Viennese Buddha? Well, nothing is appropriate to follow the last piece. But urban juxtapositions are rarely appropriate, they just are. What we did after looking at the memorial was take a tram to go and look at the Hundertwasserhaus. God, it's gorgeous: bright, riotous and life-enhancing. Why are we so churlish about using bright colours and pattern in ordinary buildings? It's not a word I ever use, but fitting is the word that occurs to me in describing the memorial to Austrian Jewish victims of the Shoah, in Judenplatz, commissioned by the City of Vienna from British artist Rachel Whiteread. It's the size of a room, a library - a size to make itself felt, but not to dominate the square. It has a definite and interesting form, enough to draw the attention, but not enough to overwhelm the meaning. I liked this review from the time of it's unveiling in 2000. The artist did well, I think. My friend M, whose father is among those commemorated, thinks so too - which must be the best measure. And yet, and yes, it was a feast for all the senses. With time and energy limited, I tried to be discriminating, but still came away with the feeling I had gorged on food and wine and art and talk. Begin with Wiener Schnitzel, melting and crispy, overflowing the plate, with creamy potato salad and the first of many light golden wines in a round glass with a thick green stem. Begin with Bruegel at the Künsthistorisches Museum, a whole room full of vivid colours, tender, monumental detail, unfaded messages from daily life. And then Van Eyck and all those grave, delicate faces by other painters of the Northern Renaissance that I love. A creamy-smooth mélange under gilded vaults, rolling and cradling the precious colour and texture of the paintings as I sip. White fleshy fish and more golden wine at a crowded sunny place in the market, and crossing the road to gaze upwards at the soft sprawling pink and green of the Majolikahaus. Early Spring seems the right time for Jungendstil - pure colours emerging from plain stone and steel. Tender Turkish kebabs - now just as typically Viennese - and curly leering statues lurking on a corner fountain. Sour-cheese pastries, flaky and filling, as we contemplate the fortress tower of the Minoritenkirche, hard but gentled by a blue sky. A long evening wander in the MAK as dusk filters through the windows and musicians send up a cool electronic background from the foyer. Exquisite objects, exquisitely displayed: curvy-perfect bentwood chairs lit in silhouette behind a screen, a big marquetry cabinet with repeated Egyptian ladies - I want to touch, to touch; light pouring through glass vases in the same pink and green as the Majolikahaus and a perfect screen with grey cobwebby drawings by Margaret Macdonald when she came to Vienna; the small, beautifully crafted objects of the Wiener Werkstätte. Breathe it in, digest it along with the red veal goulash and just one more glass of perfect wine (hurrah, I can drink this with impunity - no headaches!). And talk, and talk - my unfeigned delight in the museum opening warmth and spontaneity between us after long absence. Leave the best till last: rabbit on a skewer with buttery asparagus and then Marillen(apricot)schapps. Nah, too sweet! It's not sweet. Smell it. Taste it! Oh. Choke. Wow. Broad smile. Leave the best till last: the Belvedere. The aching prettiness of Klimt and the aching ugliness of Schiele, and the keen pleasure of spotting in the Viennese paintings not only streets and landscapes, but faces, types I've been seeing around me all week. And right before leaving, having stayed miraculously off the cakes, a slice of Sachertorte, dry and semi-sweet with sharp jam and rich chocolate. Tasting it, tasting Vienna, all the way on the airport bus. This is one dimension. My friends are Social-Democratic politicians, so, between the gourmandising and the art, be sure there was also endless talk of real life, of what else Vienna was and is. Back home, I feel odd, as full of shadows as of pleasure. Vienna is a place. For good or ill, it exists in space and time. It made me feel my edges, whereas London is pure flux and habitually, within it, so am I. I feel my edges still. They hurt. Crushing, nauseating waves of heartache wake me in the night. Is all this about me, me, or also about the tragedies of Vienna? Who knows? We can feel our edges, but not exactly where they lie. I arrive feeling lonely - two weeks away from the consuming routines of work having repaired my physical exhaustion, but brought me hard up against what I use those routines to hide from: how alone and unanchored I am. I hope for a relationship with Vienna, want the city to fill me up. Your compact centre curls in calm and elegant solidity, timeless trams circling between the regular bulk of your five- and six-storey buildings. Row on row of windows, outlined here by fine Baroque carving, here by the austere, repeated patterns of the Jugendstil, the former bursting every now and then into gold-leaf, extravagant gargoyles and fountains, the latter into lovely, subtly coloured flowers and angels. Vienna, after London, what a uniform, calm and orderly city you are, full of beauties large and small. Congenial, gemütlich, you stroke my mood and senses, soothing, anchoring my heart in time and place, yet slowly plant unease. You preserve your dark history alongside your architectural heritage. Something in the sheer size and number of your gorgeous palaces affronts. And then, the wall-plaques and small museums: here and here and here the Jewish citizens were, and are gone. Beneath your charm and beauty, a more complex, painful, bitter-sweet allure. My Viennese friends left and lived abroad, and have all returned.